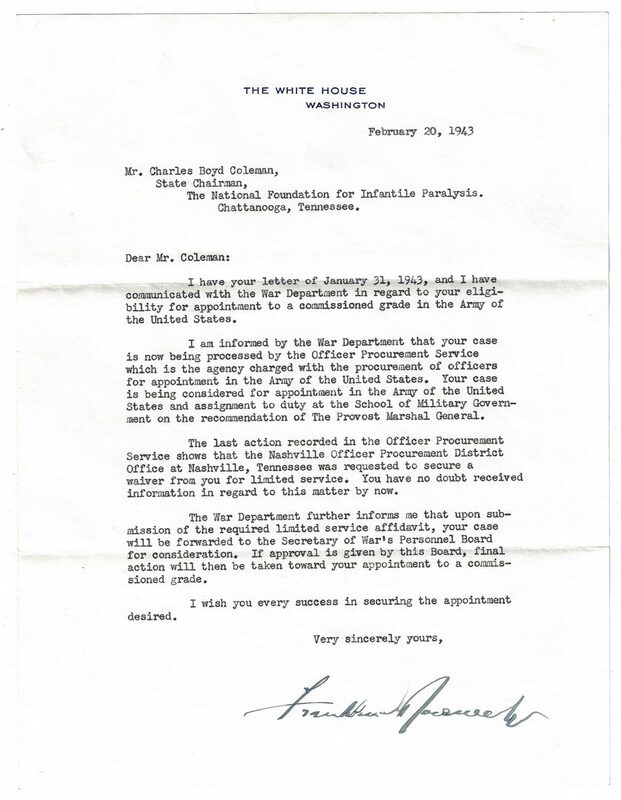 Franklin D. Roosevelt typed letter, signed "Franklin D. Roosevelt" as President on White House letterhead, to Charles Boyd Coleman of Chattanooga, TN, dated February 20, 1943. A letter of response from Coleman who was petitioning for a commissioned position in the Army of the United States. 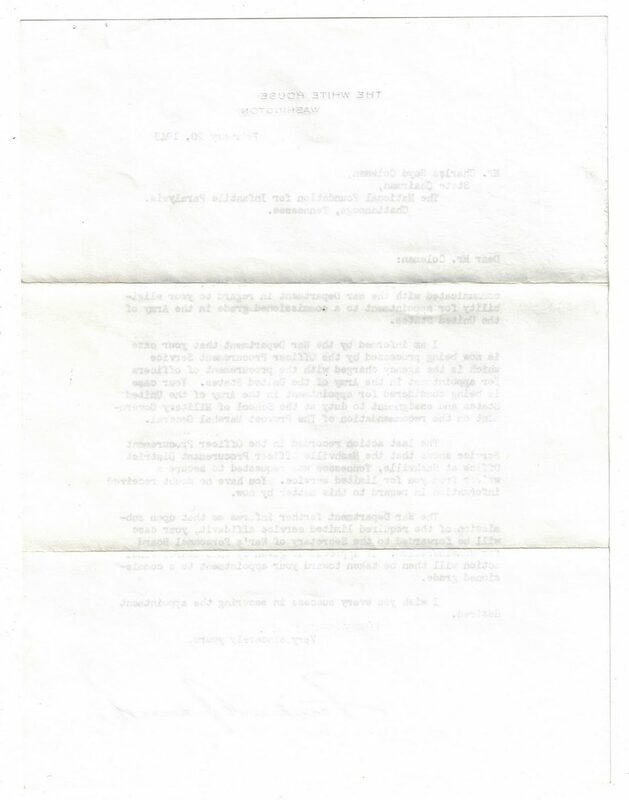 The letter reads in part: "Dear Mr. Coleman, I have your letter of January 31, 1943, and I have communicated with the War Department in regard to your eligibility for appointment to a commissioned grade in the Army of the United States…I wish you every success in securing the appointment desired. Very sincerely yours, Franklin D. Roosevelt". Provenance: The Estate of Charles Boyd Coleman, Jr., Chattanooga, TN. Note: Descended in the family of Annette Maria Dearborn Boyd, daughter of Greenleaf Dearborn (1786-1846) and great granddaughter of Maj. Genl. Henry Dearborn (1751-1829) on her mother's side. Annette was married to Charles Harrod Boyd and had four children, Annie Frances Harrod Boyd, Augusta Dearborn Boyd, Julia Wingate Boyd (wife of Lewis Minor Coleman, Jr.) and Emily Dearborn Boyd. Lewis Minor Coleman, Jr. was the son of CSA Lt. Col. Lewis M. Coleman and Mary Ambler Marshall, granddaughter of John Marshall (1755-1835), fourth Chief Justice of the United States. Charles Boyd Coleman (1904-1987), to whom this letter is addressed, was the son of Lewis M. Coleman, Jr. and Julia Wingate Boyd. He enlisted in the US Army on May 12, 1943 and was discharged on Sept. 5, 1944. Description courtesy of Stuart Lutz Historic Documents, Inc. CONDITION: Overall very good condition with a large, bold autograph. Mailing folds present. Staple marks, upper right corner.